What do I do with my father’s Engineering publications, many of which he wrote articles for? No one in the family understands them. No one followed in his path of esoteric learning. What shall I do with his 1982 card from the Canada Lands Surveyors Professional Affairs Comittee that certifies that he is a duly commisioned Canada Land Surveyor and as such is entitled by law to enter upon any lands for the purposes of any authorized survey under the Canada Lands Surveys Act dated 1982, one year before his death? It is accompanied by a receipt and fastened to a roster of names and addresses, held together by a simple paper clip.Is this worth saving for a family archive? Do I keep the roster with it? and the receipt? What do I do with the collection of play bills that Mother collected everytime she went to the theatre, which was often? I called the theatre and they are happy to have them, so that one is solved. What do I do with the cards that she saved, from her children and her sisters, saying “Happy Birthday, Mom” or “Happy Mother’s day” and not much more? And the letters saying, “Everything is fine here. Mom is well” from her sister and little else? What do I do with the pile of cotton rags she kept, clean and folded, in case we made Christmas Puddings again.They are the remnants of cotton sheets that had seen their day. (I know the recipe now; together we made a batchof Christmas puddings in her ninety third year). Will I ever make one again? What shall I do with this Royal Bank of Canada calendar from 1968 with its paper apology stapled in a note saying “30 days hath September” in large font, and an explanation of the printer’s error, giving September an extra day – the thirty first. What shall I do with this poster with Henry David Thoreau’s quotation: “Why should we be in such deperate haste to succeed, and such desperate enterprises? If a man does not keep pace with his companions, perhaps it is because he hears a different drummer. Let him step to the music which he hears, however measured or far away “. Father would quote this to me often when my trials of teenage years with Mother left me feeling perplexed, depressed and inadequate. He quietly supported me in my vision of myself then and always. This poster hung in the basement far from Mother’s daily view, but Dad and I knew it was there. It was there when I left for Europe. It was there when I came back. It was still hanging as long as Dad was alive and then the quiet symbol of rebellious opposition got put away, but not thrown out. It’s faded now. The colours of the calligraphy have faded. The bright yellow initials that stood out when the poster was young, have obscured into the yellowed background of the acid containing paper it was written on making it hard to decipher, and the edges are torn and fragile. What do I do with this box of sheet music that is no longer popular, similarly dying the death of an overdose of acidic content syndrome. What do I do with the certificates, soberly framed in black, festooned with annual stickers of continuing qualification, of Father’s profession as a Professional Engineer and as a Land Surveyor. And what about his diplomas vaunting his three degrees, Bachelor, Masters and Doctorates, from the Universities of Manitoba, British Columbia and Ohio, in the United States? Sic transit gloria mundi! Do we carry these honours from one generation to the next, accumulating the proof of our competence forward into the neverending future? Will we need a warehouse for family memorabilia? Or do I consecrate them to the ubiquitous shredder? Or hold a bonfire? Or send them to another relative to make the decision like a Trojan gift to enter their thoughts and consume them with what-to-do’s? What do I do with all these photographs, these treasures of technology when they were made, of Canada in the far north, where Father was one of the few brave souls who surveyed while there was no development whatsoever up there. He went off with French Canadian couriers de bois, whom we don’t even think exist in today’s society, who were the best guides for his travels through uncharted territory. They knew how to survive off the land, knew the signposts of river currents and weather, knew where to find a rabbit or a deer for dinner, and berries for a pie, if some of their precious supplies of flour still remained dry from their thrilling rides through whitewater. When Father passed the reigns of his office in the Canada Land Surveyors, they presented him with a Ceinture Fleché, one of those magnificent woven multicoloured belts that the courier used from their earliest adventures. What do I do with Mother’s hairpins and bobby pins, her velcro-like curlers. What about her ancient collection of office paraphernalia, mini staplers that you could carry in your purse (but can no longer get staples for), paper clips now oxidized with time, hole punchs, split rings, straight pen nibs and yellowing clear adhesive tape. What about the lapel pins and coffee spoons branded with cities’ insignia enamelled on them, that she collected from her travels? And the tourist pamphlets from Moscow, from China, and Copenhagen, Oslo and Jugoslavia; or printed histories from Greig’s house and Mozart’s, and Beethoven’s; leaflets from the Salzburg salt mines and programs from Oberammergau; from Ayer’s Rock and from the Auckland Art gallery; and postcards from the Blue Mosque somewhere in Turkey and from the Parthenon in Greece.. Mother travelled. It would be easy to chuck these, but would I need them some future time to capture the length and breath of her wanderings, in her late sixties and her seventies. She wanted to go everywhere, see everything in the world, as long as there was tour bus to take her there. And what do I do with all these group photos of fellow tourists, and “oh yes” there’s Mother in the middle row, three from the left, her 1970’s horn rimmed glasses always a clue to her location in the group. Without the house, once it’s sold; without these collected detritus of their lives, will my parents still exist in memory? Of all the windstorms we suffered this past winter, I always think of the last one as the most ferocious. Mother’s friend, Doctor Gee, asked Otto and me to dinner at Easter time, some months after Mother passed away. He’s such a lovely man. At ninety five, he is still living in his own home with the assistance of a part time care helper who makes his meals, does his housework, takes him for walks and to his doctor and dental appointments. Mother and Doctor Gee were university contemporaries and these two nonegenarians were the last of a coterie of grads from the University of Winnipeg class of 1931. It was a treasured relationship for the friendship itself. Even more, though, one of the lonelinest things about aging is that one has no more contemporaries, and in this friendship, they understood each other, what their era had been about, its mores, manners and ethics as well as the historical events and pressures that had molded them. They loved each other profoundly in a platonic relationship of mutual admiration. They understood each other in a deep and quiet way. Doctor Gee was saddened terribly by Mother’s passing. He and his wife had lived in the capital city of Ottawa for many years. He was a director in some government department and his wife was a lawyer with the Department of Justice. When they retired, they came out to Vancouver and the friendship between these three continued to prosper. Doctor Gee’s wife passed on a few years ago. When she left this earthly coil after a long illness where he cared for her all the while at home, he read out the most beautiful, loving eulogy about her that you could imagine. Here was a marriage that was made in heaven. Two gentle loving people, both encouraging the other to excel in the pursuits of designing the common good for mankind and being successful in carrying forward their ideals. To the end, they adored each other, and he is still carrying a flame for her, though she has gone on ahead. Doctor Gee is a true believer in correct form. He knows his manners inside and out, but would never embarrass someone if they do not know the rules. I’ve caught him with an ever so slight lifting of an eyebrow, an almost imperceptible wince, from time to time, but he says nothing; would not point out an error to a young one or a guest whilst dining, for instance. Nephew Hugh has fallen in love with this diplomatic gentleman. Hugh is in awe that Doctor Gee has the latest in electronic gizmos, buys the best of computers in a yearly update to have “the latest” and never has to ask how anything operates. His mind is sharp and clear. When Doctor Gee leaves our company after a family dinner, he pulls out his Blackberry, rings up the taxi company he deals with regularly, asks for his hat and coat and goes his merry way. Hugh has a dread that he will go to dinner with Doctor Gee (and Doctor Gee’s pleasure is to invite people out to dinner at the fanciest of places) and make some gaff in etiquette. Where our efforts at training Hugh in the simple version of the Queen’s rules of dinner eating failed miserably at home, here, on a night out with Doctor Gee, he is attentive to the point of desperation, trying to ensure that he copies Doctor Gee’s manners and that he understands his logic in placing people around the table. Hugh has aspirations of rubbing shoulders with the diplomatic corps in his future. He’s going to Ottawa this fall to continue his studies in Political Science. He’s more interested in analysis of political situations than in being a diplomat, but he wants to shine brilliantly in his field, wants to be the star of all analysts, and it would not do to show himself the least bit uncouthly in dealing with his colleagues. Where there is a purpose for learning, it magnifies the attention the learner lends it. Doctor Gee and his wife never had children, and being from the Depression Generation, they were avid savers. At the end of his life, Dr. Gee has an accumulation of wealth that he has no difficulty now in spending on what he loves to do. After all, with no children, what is he saving it for? It’s time to spend. Until last year in his ninety third year, he had no problem in jumping on a plane and going off to some socialist convention, as a card carrying member, to express his opinions and be counted in the vote for this policy or that. While he was at it, he would go up to see friends in the middle of Ontario, then go back to Winnipeg to visit his nephew, then come home. He is failing slowly and he now takes his care aide with him. She’s been the same one for many years, was his wife’s care giver, and continues on with Doctor Gee. She’s become like one of the family and now comes to the many of the dinners Doctor Gee organizes. So, I started to say, Otto and I were invited to meet Doctor Gee and his company at the Stanley Park Ferguson Point Tea Room. It’s changed it’s name in the past few years, so I don’t know if I’ve got the name right. It’s the one that looks out over the ocean in the area of Second and Third Beach, very near the poet, Pauline Johnson’s memorial. Otto thought he could access the restaurant by Third Beach so we drove through the narrow streets of the West End to that entrance, then found ourselves in a one way situation where we could no longer get near the restaurant and had to turn around in a parking lot and come back along the Lost Lagoon access road to find another way. There was nothing for it. We had to go half way around the park via the cut off at the Georgia Street entrance. In our meanderings around the West End entrance, the forest seemed almost normal, just a little thinned out, an occasional tree downed , roots uplifted like a giant tutu-ed dancer bent over with her bottom in the air. Now we were driving parallel to the causeway and then right across to just east of Lumberman’s Arch. There were piles of great logs by the roadside and debris of branches and fir fronds beside it that had been cleared off the road, but still needed to be carted away. Where there had been a thick dark forest of three hundred year old trees, there was open air and a dazzling yellow light coming through the brave few survivors of the storm. Again, these tutus of root and soil bared their undersides, but so many of them, there was an impression of warriors fallen and their giant round shields with Celtic root knotwork decoration dully tarnishing on their last battlefield, beside them. It reminded me of Verdun where every centimeter of soil had been bombarded at least once. Only jagged tree stumps had remained there. In this park there were a few more survivors than that, and the ground was green with ever persistent swordferns. We drove on where the road goes up and around, then under the Lions Gate bridge, still in the park, approaching Prospect Point where there is another restaurant, a casual dining one, and a tourist trap gift store. From these two vantage points, one is able to see across to the North Shore and out across Burrard Inlet. It is a magnificent view. Just below this Point is Siwash Rock, by legend the Squamish hero who was changed into a rock to glorify his purity and unselfishness. Hundreds of thousands of visitors come to see this rock every year. Before the storm, people could park their cars at this stopping point, and be greeted by a screen of tall firs that would lace some of the most beautiful sunsets. A short walk to the view point takes one to some of those rent-a-telescopes and the view which had, by man’s hand, become unobstructed for a full glorious view of the North Shore mountains, the communities of North and West Vancouver, the mouth of the Capilano River, and the renowned First Narrows Bridge. Familiarly called the Lions Gate Bridge, it is an engineering feat of its time, a long spanned suspension bridge built in the same year as the Golden Gate Bridge in 1937 (they look the same too!) , contrasting its cheery orange paintwork against a predominantly blue landscape. It’s a fascinating view, especially as this is the gateway to the to the Port of Vancouver and there is an endless traffic of giant cruise ships, tankers, cargo ships, sailboats and pleasure crafts. On our way to dinner (yes, we finally got there – we were just forced to take a detour, you see), this was my first view of the storm’s devastation. Prospect Point must have born the brunt of the howling winds from two directions. There was nothing left. Nothing! You could now see right out to the west. There was no lovely tree lace to decorate the sunset. Prospect Point had become bald! There was more debris, more giant logs lining both sides of the highway. The City had worked three months to clean and open up the roadways, and still it looked as if the Wind Gods had left their matchsticks and pick up sticks out in the rain after a lusty day of play. We were in awe of the forces that had wrought this work. We arrived at Ferguson Point soon thereafter, settled into a parking space, awe still in our conversation, awe still marked on our faces. This was indeed devastation. There was Doctor Gee and his dinner companion, waiting at the most advantageous table in the restaurant, looking straight out on the sunset in preparation at the mouth of Burrard Inlet as it joins the Georgia Straight. In the late day sun, the mass of tulips in the gardens at the foot of the window swayed to a gentle breeze. Spring was here in force. A party of ten teenage girls celebrating a friend’s birthday were dressed in their prom-like best dresses, unquenchable, goofing about as they waited for a photographer to capture the moment, backdropped on this magnificent scenery. We entered and greeted our host and his invitee, commenced pleasantries of how we were doing and comments on our health. Down the eerie hallway, emergency lighting kicked in. It was dinner time and most of the inmates of this kooky residence were on the main floor waiting for the aides to help them up the elevator. With the power out, the elevators weren’t running. Over a hundred residents and most of the employees now had to stay on the main floor. People seem to forget that elderly people have had experiences in their lives. People seem to assume that once a person is relegated to these hellish antechambers to heaven, that they are incapable of thinking or reasoning. In fact, the generation of people being processed through the entrance trials for dying are full of experience that has been parked at the door, waiting for the final run. Staff and visitors are generally ignorant of their personalities, of their rich lives behind them, of their accomplishments, their tribulations they have conquered, the prizes they have won and the works they have excelled at. Most of these residents were from pioneering families who lived with grit and determination to carve out communities where none had existed before. Most had lived through the Great Depression and at least one World War; many have lived through two. One told me her own tales of the blitz in London and how her father, one of the volunteer Home Guard, had been blown to smithereens one night in a bombing on Downing street and the fact of it was announced at her door by a police man the next day. Another had told of her experiences in the Dutch East Indies army during the Second World War. That was hairy! Mrs. C had been a reporter for the Vancouver Sun and the Province her whole life, and Mrs. M had been a politician both in the provincial government and in the federal. Molly had been in the flooded parts of the province in 1948 when the Fraser had spilled over the dykes stranding thousands. Peter the architect had travelled world wide with his professional duties. There were several doctors and university professors. You wouldn’t know it to look at them, all crippled and wrinkled as they were, doddering on unstable legs, shuffling along in their walkers and being pushed in their wheelchairs, unable to hear, to see and impaired in their speaking. Everyone had a story to tell, but few had someone to tell it to, so they became anonymous bodies to be cared for, like sacks of potatoes. And so, sacks of potatoes and cognizant alike, were lined up along the full length of the long hall to the dining room and adjoining television/lounge area wrapped as best as possible in blankets from the store room. They looked like they were on a ship cruise sunning themselves, waiting for the activity director to propose the next diversion, only it was dark inside. Most of them recognized the power outage for what it was, stoically ready to wait in the darkness until the power could be restored. Some pioneering spirits were trying to comfort some less coherent inmates; others, telling stories to cheer their compatriots in adventure, some trying to get the attention of the nurses and aides who could barely cope with the magnitude of needs that were all massed together making concurrent demands on their skills. This was one time when economies of scale were not working. Having everyone together requesting attention at the same time was not conducive to a calming outcome! However, this night was one where the staff shone. No one went home, even though it was long after their usual quitting time. The manager phoned to other staff, off duty, and asked those who could to come back. It was going to be quite a task keeping these hundred elderly patients calm in the dining room and hallways of the main floor. I can tell you now that the event lasted eight and a half hours. There were pills to give, people to take to the bathroom, people who needed to lie down. I challenge you to imagine how hard it would be for you, yourself, to sit in the same place for eight hours – to sit upright, unable to lie down, nor relax, nor amuse yourself, nor get up and stretch your legs, or do something constructive about your own situation. It was something like a trip to Australia without the leg break in Hawaii. We’d be going crazy, I’d say. I was amazed, too, at the calm that the residents themselves brought to the occasion. In the murky dark, a few emergency lights shone. The main entrance, in fire alarm mode, had switched to fail safe – the outer automatic door was permanently open letting in a howling wind to the first lobby, blocked by a poorly insulated second set of manual doors. It was decidedly cool and the heat was no longer circulating in the building since the air handling units were shut down. Two employees guarded the door. There were a number of escape artists amongst the residents. How could one even think of abandoning the other patients on a night like this to go looking for a foolhardy escapist who would brave the storm without any thought to their comfort or safety. It must not happen! By the time Otto and I had arrived, not knowing the power failures had affected the residence, the staff had calmed the few wailers and assisted half of the residents to sofas in the television corner. Those with walkers or wheel chairs were lined up against the walls waiting for the elevator to come back on. A few more hardy souls were trying to play cards by candlelight at one of the dinner tables, hindered cruelly in their failing eyesight by the pitched gloom. From our opposing perspectives, our emergency mode kicked in. Otto could see that people needed entertaining. He is wonderful at this. He loves gathering, parties, telling stories. He has an amazing ability to remember people’s names and a little fact about them. It is his one quality that makes him shine at his business net-working. He moved from one resident to another, greeting them by name, asking them how they were bearing up, telling them a little tale of the world outside, and moving on to the next one. They were happy for the diversion and it cheered the company immensely. Mother, we both agreed, could wait. She had Heather in attendance and Otto’s ex-wife keeping her company. In any case, Mother was too absorbed in her process of dying to be cognizant of the world past her own bed. She was completely internalized now. I, too, was greeting the residents, but mostly the ones I had gotten to know in a deeper way. I ran emergency commissions for those who were fretting to a point of sub-panic. Maria, for instance, was upset about her pills. If not taken on time, she would go into convulsions. She had been sitting in the same place for over two hours already and could not capture a nurse’s attention to tell of her plight. I found the fourth floor nurse and explained Maria’s concern. Someone would have to run up the emergency fire escape stairs to the fourth floor and obtain the pills. It was arranged, and I went on to the next one. Another resident was unusually cold and I found someone on staff to give me an extra blanket for her. Dr. John who lived across the hall from Mother had Parkinsons disease. It had advanced to the stage where he could only sit up so long. I hailed a passing employee and requested some place where he might lie down. The need to lie down turned out to be a problem for others as well and something was arranged, though now I can’t remember what, to accommodate them. At the front desk, the reception was lit with a few candles and one good flashlight. Though the candles worried us for the risk of fire, there was not much option. The emergency lights were faltering. One by one, they were extinguishing, depending on the remaining power in the battery packs. They were meant to keep the place lit for an evacuation, not for maintaining light during an extended power outage. Now we were really in the dark. Otto and I revised our plans. This was, after all, an adventure! We could be an extra two useful bodies! But first of all, we needed to see Heather and Mom. We were given one flashlight to navigate up the emergency escape stairs. It was all that could be spared. The magnetic safety lock on the stairwell was released. We opened the fire door and began to climb. Now, I’ve some pretty arthritic knees that complain loudly about stairs, but it had to be done. Pulling myself along by the metal tube railing, step by step, we climbed the four floors. “Are you coming?” impatient Otto called. He was faster, and his wavering light was hardly helpful to me. I was feeling the next stair with my toe before setting upon it. It would be horrible to fall now in this stairwell, on concrete, and add to the confusion and turmoil below. Gratefully, I saw that Otto was opening the fourth floor stairwell door, waiting for me. I stood, breathing deeply on the top stair, catching my breath. I was out of shape. I’d need to do this daily to not tremble with the effort. Positively thinking, it was great exercise! We passed by the nursing station where Gina, the only employee on the fourth floor, was standing by seemingly unable to do anything but wait until circumstances changed. “Are you managing?” we asked, as we fished for details on what help was available. Who, for instance, was going to bring Mother’s hourly morphine? What if additional services were needed. How was she going to phone the ambulance, if necessary? All the phone lines were out. All the intercom was disabled by the power failure. Who would help her if two people were needed for a nursing task? “Well, how many people are there on the floor?” we asked. I thought, How horrible! Those residents were lying in the pitch dark, unable to call for help if they needed it; with no one to up date them on progress. There was not even any ambient light from the city street lights. Everything was out and black. In Mother’s room, a one dollar Canadian tire flashlight was illuminating Heather’s face, Otto’s ex and little Ethel, like a modernized candle lit tableau of George de la Tour. They had been unable to leave Mom and so were eager to hear our description of the situation below. We promised to come back for a slightly later night shift but in the interim, we were going back home for all the flashlights we could spare and all our home’s overstock of candles and batteries. No one had counted on a full night power outage. No one could have foreseen that it would occur on a Sunday night when not a single store would be open selling flashlights or batteries. Scout’s honour, they were not prepared. “How did you get here, Ethel?” I asked. “Yes, but how did you get back up here from dinner?” I insisted. “Or didn’t you have your dinner?” She was so slight she hardly ate her dinner. It would not have bothered her to miss it. I was amazed and horrified at the same time. The staff had release the lock on the fire stairwell to let her walk up. She was a sweet little bundle of determination, but she was unstable on her legs and frail. How could they have let her come up four flights on her own? It was unconscionable! And yet her grit and perseverence had brought her here unscathed. Truly, to have succeeded at this task, she was either an angel or under an angel’s wing. As we were talking, I heard a weak sounding, “Hello? Hello?” from somewhere in the hall way. While the others were chatting and planning, I took one light and went out to see whence came the tiny voice. On the floor across the hall, I could see Doris’ head extending outside her doorway, calling weakly. “Oh my poor dear!” I cried. Otto came running as he heard me speak. Doris recounted her need for the bathroom, how she had gotten up, since no one came (that dreadful fear of wetting one’s bed drives people to do unsafe things!) and tried to feel her way to the bathroom. Something, she could not say what, had gone wrong and here she was. Now what? I thought rapidly. This was not my responsibility and anyway, I couldn’t lift her. My first aid training said never to lift a fallen patient until they had been checked for bruises, cuts and bone breaks. I reported the fall to Gina who shrugged her shoulders a little in a gesture that repeated her earlier despair of What can I do? “She’s always falling” she drawled somewhat defensively. I’m all alone up here,” she answered in a frustrating non sequitor. “I can’t leave my station.” It wasn’t a refusal to do anything, but it seemed obstructive. My years of authority kicked in. This nurse was going to take responsibility or my name wasn’t Kay! The tone of my voice must have stirred her. She did not answer. Her eyes searched mine in the dim light to see how serious I was and what trouble I could make afterwards. She broke the stare, lowered her eyes, said nothing more and went. Five minutes later, two aides came and Gina was back at her post. “Oh, she always falls”, confirmed one of the girls. Without ceremony, without checking Doris’ condition, one locked a wheelchair to prevent it from slipping and each took one side of Doris under her shoulder and heaved the hundredweight sack of potatoes into the wheelchair. With one more adjustment for comfort, Doris was settled into the chair. Before we left on our treasure hunt for batteries and candles, I spent a few minutes getting to know this lovely sack of potatoes, now restored to her bed. She hadn’t known why the lights were out, but she was glad to be back in her own bed and dry. On her side of the residence, there was a faint glow from a distant part of the city still operating on electricity. She assured me she would be fine and she had suffered no great hurts and so I left her. Otto and I returned an hour later. We gave our safety gear to the reception desk. They, in turn, offered us pizza that they had ordered in for the staff who had stayed much after their normal times. Otto and I had been thinking en route, that there were many things about a prolonged emergency that this facility did not seem to think about. We had suggestions and were not shy in giving them, as diplomatically as possible. We chatted casually, but inserted questions that we thought bore merit as we went. There were many more things, like the emergency stairwells now entirely in the dark, no highlighting on the nosing of each riser; the handrailing hard to grasp and not continuous down the stairwell so that the landings were difficult for mobility impaired to negotiate. I’d been in the property management business too long for these things to go unnoticed. How had this residence gotten past these safety requirements? Surely they had to comply. Or was the the thirty year old building “grandfathered”, not requiring upgrades until a major renovation was undertaken. Noreen, still wearing her visored cap even though a ray of sunshine was impossible, interrupted us. Noreen, you may remember, greets me daily with “Do I know you from somewhere?” with her quizzical eyebrows lifting and her perfectly mannered way, looking as if she had just jauntily left the tennis court at the Club. She was worrying about getting to the bathroom. On the main floor, there were only two – a man’s and a woman’s. They were in the centre of this vast room, just facing the rows of residents whose only occupation now was to watch what the other stranded residents were doing and to comment. “What will I do with this? ” she asked as she took the flashlight reluctantly from my hand and eyed it as if it were a foreign object with alien germs on it. “Not soon enough for you to wait. Go on,” I commanded, “take the flashlight and go in there.” And so she did. Within seconds, she was back out again. “There’s no light in there.” She was both puzzled and a bit imperious, as if someone had failed her. I explained again that the power was off and we would have to wait for the power company to restore power. I directed her back into the washroom and instructed her again on the flashlight. She came back out minutes later saying with a puzzled look, “Someone must have left this behind in in the bathroom. Do you know who it could belong to?” as she held out her right hand dangling the flashlight aloft. “It’s mine. I lent it to you,” I said with a touch of amusement. She just couldn’t remember. “Oh!” she said and she handed it to me. “She doesn’t need to go in there,” grumbled a lucid resident who had no patience for Noreen. Noreen looked as if she were a very healthy sixty, someone who had exercised effectively all her life. An aerobics instructor, one might guess, from her looks. Looking so young, she had no right to be confused or repetitive. But Noreen had Alzheimer’s and could not remember anything from minute to minute. “She’s already been in there about seven times” continued the grumbler, loudly. “It doesn’t really matter,” I soothed. “If she thinks she needs to, then that’s all that matters. She can’t remember what she does. She can’t remember anything. That’s why she’s here.” I said. The grumbler was not getting any sympathy from my corner and she went back to her neighbour to continue on her discontent. How did all this end, you might ask? We went back up to mother’s room. It was about two thirty in the morning when the lights suddenly came back on. We all lifted our heads and looked about us. Tired as we were, we had adreniline from the night’s activity. I heard the elevators humming. They were operating again. I knew they would be full and I braved the stairwell again, going down to help bring back the sleepy, stranded residents. When I got there to offer my services, there were only two residents in wheelchairs still to be sent aloft. In an inhabitual of spurt of efficiency, the staff had returned nearly a hundred residents to their rooms to resume their normal night within fifteen minutes. I went back up to a dozy vigil in Mother’s room. We shooed little Ethel back to her room to get some sleep; and Otto took Heather home for a well deserved rest. Did I tell you about the night of the storm? We had eight major wind storms on the West Coast this winter starting in late October. One of them devastated Stanley Park, that truly wonderful piece of nature that some forward looking pioneer set aside in what became the centre of Vancouver. On the first of these stormy nights, power was shut off to a great part of the Lower Mainland including our house. Nephew Hugh was working from home when all of a sudden, his connection to the Internet was cut.Both telephone and electricity were out! Some slackards might have said, “Well, I can’t work anymore” but Hugh has a fine work ethic and so he began to phone around to his network of friends looking for an unaffected part of the city where he could go and continue on with his work. He’s a web programmer. One of his university friends lives just six blocks away on the other side of the street. It was outside of our power grid and so he put his laptop in his backpack, put on a good wind and rain breaker and trod down to the other house to finish off his work day. It was just noon time. Otto was also working from home. He phone in to his head office and went there, but not before ransacking the cupboard where the candles are kept for Christmas and for emergencies. He set them, at least one for every room in the upstairs and several along the mantle piece where there is a large mirror to help double up the light once the candles were lit. I was at work and oblivious to all this bouleversement of everyone’s day until, at three o’clock, there was an announcement that those who lived out in the suburbs could go home early given the severity of the weather. That clued me in to the fact that the rain drumming on my plate glass office wall was no ordinary rain. I had much to do, but I gathered up and finished off the task I was doing, closed up my desk and put on my coat, scarf and boots. When I got out the front door, I could see that my umbrella was going to do me no good. An umbrella in this weather was just going to whip me up into the heavens or pull me along the direction it wanted, not mine. I left it furled and stood huddled as far in as I could at the bus stop to prevent the whipping wind from driving rain onto me. When the bus arrived I dashed for the door and found I would need to stand the whole way home. Everyone had been dismissed early. The buses were full. Halfway home, the power lines for the buses were out. We were unceremoniously ejected from the trolley bus, a wet and sodden mass of humanity, waiting for a gas powered bus to replace it. About a half dozen of us impatient people fumbled for our cell phones and called taxis. They too were overloaded and there were no promises when a taxi might come. By the time two more buses were parked behind ours, we were rescued by a replacement bus which was crowded to the ceiling with our damp woolen-covered bodies and it lumbered up the hill, far too heavy for its normal operation, slithering ponderously through the dark like an earthworm in its tunnel. All the street lights were out along this line and the way was only lit by the cars driving, snaking along this major artery. It was very eerie. Finally, after an hour’s venture, I descended from the bus at my stop just a block away from home. There were lights on the other side of the street at the shopping centre, an area whose power grid was not yet down, which dimly lit our side of the street. I came home to a lifeless looking house with a weak wavering candlelight in the window. I fumbled my key into the lock by feel and entered, so thankfully home. The mantle mirror was bravely doubling the light of motley candles upon it, but the room was still in gloom. Hugh had arrived just lately and greeted me, very relieved to see that I had made it home. He has a good heart, has our Hugh. He worries about me and though I pooh pooh it on the surface, I really love it that he has an honest concern for me. We recounted our days and our travels home, then turned to what we might do for dinner. A flashlight in the fridge announced a number of things we could eat cold, but it was such a night that eating cold was not very attractive. The lights across the street encouraged us. Perhaps there was a restaurant that could provide us with some hearty fare and warm our spirits. We agreed to drive to a district with power to get ourselves a modest dinner. Later we could find a coffee shop to provide us with the biggest coffee one can take out so that we might have a hot coffee when we finally got home. Surely by morning the power would be restored. Of course, I was worrying about Mother, Hugh’s Gran. Hugh had not seen her except when we were moving her to her nursing home several months ago. He had taken the brunt of her craziness when we came to the point of her needing long term hospitalized care. He had been staying home with her, trying to work from home, being driven crazy himself trying to meet her ever increasing needs while working – and it didn’t work. When it came to a crisis, Hugh was anguished, torn between his loving, nurturing nature and his rejecting reaction to her impossible demands. After all was resolved, the upshot was that he hadn’t wanted to see her. Now, I could tell that Mother was deteriorating. She would not be around much longer. For Hugh’s peace of mind, he needed to see her and reconcile or he would always live with the anguish of his conflicting emotions about his grandmother who had been so wonderfully loving and supportive of him as well as the bane of his day to day at one particular moment of his life. He agreed readily to come with me to see her, to bring her a flashlight in case she needed it, and for us to stay, if need be, if she were frightened by the dark. After our cheery dinner at a not so distant Greek place which was thriving on the company generated by the storm, we went to Grandma’s residence. It was lit up like a Christmas tree, insouciant of the storm blowing around it. This section of the city had not been affected whatsoever by the power outages. We found Mother dozing lightly on her hospital bed, slightly raised on the head end, pillows propping up her head and also at her feet, to improve her circulation, surprised and happy to see us. “Hugh!” she exclaimed, her face lit with a spontaneous smile. She held out her two hand to clasp his face between them and he bent down to give her a kiss. “Grandma!” he said, his fears about his reception by her forgotten, the love streaming from his Grandma dispelling them instantaneously. They stayed like that, he hovering just slightly above her face, she holding his in her two hands like a prayer fulfilled, for long few seconds while they drunk each other in. “Why wouldn’t I be alright?” she said puzzled. So we told her what our day was like and how Hugh had needed to find somewhere else to work and how I had come home in the storm. “Oh dear!” she exclaimed, but it seemed to affect her as if we were telling a fairy tale. We didn’t stay long after that. She had heard nothing, one of the few benefits of deafness, and was not worried. Everything seemed normal to her. She was tired and we suggested that we best should be guarding the home front where the alarm would no longer be working if the power were off. So we left after just a short visit. Hugh was light hearted. It had made a pivotal difference in how he remembered his Gran. He was solicitous and concerned again for her. Truly he loved her deeply and this had gone a long way to reconcile his disaffection. Gran, on the other hand, was so forgetful of recent things that she had not noticed he had been away for such a long time from her. Any disagreements they might have had in their day-to-day when Hugh had stayed home for her had been lost to view. She just knew him and loved him as she always had, all the years of his life. Hugh and I went home, lit many candles and sat in the living room together, our coffees lukewarm but comforting. We shared a crossword puzzle together, me reading the clues and filling in the blanks, Hugh supplying answers until my eyes gave out. Then we traded roles. It was soon time for bed so we went our separate ways in the profound darkness of the house. Profound silence, I should also say, with the computers off, the refrigerator too, and other various things that hum in the night as they operate. For a woman with short memory problems, this was a night to remember. Almost daily, Mother would remind me that she had been thrilled that we would spend the entire night with her to make sure she would not be afraid. She told the tale at the dinner table. When visitors came, it was her latest news. It bore repeating and repeating. “I lost all my worries when I knew they would stay all night with me,” she said, and she beamed proudly. She was a young child to start school, just five, but she was smarter than a whip. Granny walked with her the first day to introduce her to her teacher. Mabel, her sister, older by ten years, was commissioned to bring her home for lunch. But as the days went on, Mama did not want to go to school. She was not strong. She lingered and wavered. She wheedled to no avail. She must go to school. At ninety five, she could remember the name of every teacher she had and had visions in her mind of each of them, could tell stories about them. Funny thing was, she loved school and knew from her earliest years that she wanted to be a teacher. She remembered how her mother had struggled each week to provide her with money so that she could participate in the savings program at school. Each child had a bank book and each week they deposited twenty-five cents. A dollar a month. She often repeated this story because it had left an indelible print on her ethics. She saved. To her amazement, at the end of her schooling, she had over one hundred dollars in her bank account! It was a lot of money when bread was five cents and an ice cream cone, ten. It was an established habit and thereafter when she was working, she always put money away, every pay cheque. She remembered the stern Miss Caldwell, too. Miss Caldwell was the first principal she had in Winnipeg schools when she was teaching. She relentlessly tested her teachers and their fitness for teaching. She could drop in at any time and demand that the teacher find a word in the dictionary by opening the page within two or three pages of where it should be found. It was a very important skill for teachers of the Nineteen Thirties. Miss Caldwell also demanded a very strict adherence to form. Writing and printing on the blackboard should be precise and clear, always aligned in very straight ruled lines. Mother had studied the MacLean Method of Handwriting and exceeded Miss Caldwell’s expectations on this point without difficulty. Mother and her two sisters had so firmly internalized the MacLean Method that you could barely tell the difference between their handwriting. Eighty years later, in her early nineties, her handwriting had hardly wavered. Countless children had written ‘The quick brown fox jumped over the lazy dog, ” over and over until they could flawlessly, uniformly, copy Mr. MacLean’s rounded script. This phrase contained every letter in the alphabet. In Grade Three, I remember verifying all twenty six letters were there. I sat at my desk, inkwell in the upper corner, filled regularly by a student monitor, dipping my steel nibbed pen into the pot, blurting ink blobs across the page, concentrating as I formed the same phrase Mother had learned to write years before. My little tongue licked my upper lip, back and forth, back and forth in concentration as I struggled to match Mr. MacLean’s beautiful script. It was still the method of writing when I started learning to write at school but I did not succeed. Father, on the other hand, had been influenced by a more cursive, lean and economical European handwriting and then, after his Engineer training and the strict lettering required for draughtsmen’s drawings, he had acquired a more personal style that I found fascinating. Father’s sister, our Aunt Delia, had hand writing that was quavery and the lines began to descend perilously into the page while still in her mid eighties, which most likely should be attributed to her eye troubles. But mother, who had had cataracts removed and who was progressively more blind, finally legally blind, could still form her letters beautifully, by some kinetic magic. Now this may seem like a change of subject, but you will see how it connects up. Mother had difficulty in walking. Her osteoporosis had worn down her right hip and it had been replaced in 1997. Now, don’t you just wonder why one hip deteriorates and not the other? After a long time in rehabilitation, she was home and walking every day, taking walks by herself, if need be, a mile or so away. She joined the walking club, early morning before the stores opened, to go circles around the stores. It was an activity designed to keep seniors walking in safe circumstances, at the shelter from wind, rain, cold or other extremes of weather, with an added benefit to the merchants that the seniors often stayed to socialize, to have a cup of tea and a snack and afterwards, and to buy in the stores. This worked for some five or six years, but then, other joints began to complain. Mother’s body was wearing out. We teased her about being Bionic Woman because of her replaced hip and her new, permanent lenses (inserted after the cataract operation) and her electronic hearing aid. Now her spine and and her knees were beginning to fail. On good days, she could get her exercise, but more and more, there were bad days. Bad days for her hip. Bad days for her knees. Bad days for her aching back. Aching days for her beautiful, gracious hands. Osteo was joined by arthritis and it would only get worse. I separated from Franc in 1994. Much as I loved him and wanted our relationship to work, Franc had his own life problems to sort out and we just couldn’t keep living together. He had to do his next step on his own. It was painful, bitter and difficult as all separations are. I went away to Winnipeg on a six months assignment through my work. It gave a good solid closing to a relationship that had become very angry and negative. It gave me a very positive beginning at something new. I had some learning to do, myself. I booked into the Fort Garry Hotel residence, an ideal place for business travellers. It granted more freedom than a regular hotel room because one could make meals in the kitchenette. It had less intrusive housekeeping. One could settle in for a while and yet still access the hotel offerings of restaurant, tuck shop, mail service, over night dry cleaning, et cetera, et cetera, and it was central. After three days, I called Mom to see how she was. She was living alone in her house, aged eighty five, and managing but with enough struggle in her fierce need for independence that I was always attentive to her potential needs. Now I worried about her being on her own, and me, her only daughter within reasonable distance to respond to anything she might have difficulty with, gone half way across Canada. It would not be simple to get home in a hurry. I rattled on about my trip, the plane ride, finding the hotel. I told her about Arthur, a colleague formerly from the Vancouver office asking me to dinner at his home with his wife and six kids on the day after I arrived. Cathy had phoned and was ready to greet me at work on the Monday. She would invite me for dinner soon. She too had worked in the the Vancouver Office. There was nothing I could do but sympathize. There was no way I could go look after her from Winnipeg. I’d just gotten here. I was starting a new job. I couldn’t just ask to leave as soon as I had arrived. I phoned my sisters later but they also lived at a great distance, had jobs and couldn’t get away. We set up a schedule to phone her, taking turns so that she would at least have lots of phone company. There was Otto, but I could never get hold of him by telephone. He hadn’t been schooled in care giving like we females had been. He would not let her starve; maybe would get her groceries for her. But who would help her dressing; help her dial a telephone; pour a kettle for her safely; cook a meal? I’m much better at long stories than short, so I’d better get back to the point. At the end of the fifth month of my very successful assignment, my fully recovered mother came to visit with me in Winnipeg. We spent the last four weeks together in her home town. With only a few minor clashes, we got along very well. She was, after all, in my home and so she was very flexible. The last weekend was the Queen’s birthday, otherwise known as the Victoria Day statutory holiday. I rented a car and we drove from Winnipeg to the small prairie towns of Plumas and Gladstone where her father had homesteaded. We drove up to Ashern where my father’s family had homesteaded. We stopped in Gimli where mother had once been for a summer vacation. We drove past Selkirk. We saw a sign for the town where she had had her first teaching job, but it was late and I was exhausted from our seven hundred kilometer jaunt around the province in the space of two days. We didn’t go there. As we drove into Winnipeg, she started to navigate for me. Now you must understand that mother hated driving and she had no sense of direction. “Where are we going?” I asked rather petulantly. “Never mind,” she said in a voice that brooked no dissension . Exhausted as I was and thoroughly anxious to get home before I collapsed from fatigue, I dared not disobey. Finally, as we went up and down some less than familiar streets in the North End of Winnipeg, she said suddenly, “Stop! Stop here!” and I did. Triumphantly she pointed to the two storey house on the corner. “I was born in that house,” she said. “That room upstairs on the left was mine and Bessie’s, Mabel was at the back, the two boys shared a room. Father had to live downstairs in the living room because he was so sick, severely crippled with arthritis; and mother was in a day bed beside him in case he needed her in the night. ” Mother had not seen the house in fifty years or more. She told me more about the family. She named all the neighbours along the street and told me what the fathers did for work – mostly engineers and mechanics for the railroad industry. Then she had me drive around the neighbourhood, pointing out the schools she had attended and those she had taught at. She drove me past where she and her siblings had attended the Salter Street Mission after school and on Sundays. Although I was exhausted, I was thrilled. She had been with me almost a month. In all of our conversations about Winnipeg in its early days, she had steadfastly refused to go with me to see her family home. It was in the poor part of town and she had made such progress in her life that she was now living in an upper middle class district. What might I think of her poor beginnings? She did not want to leave me with a mental picture of it. It was best left unseen. Now I had seen it, I had no such feelings as she imagined I might. I was delighted to have put context to her beginnings. Despite her worries, the district looked quite normal. The only thing that I remarked was that much of the land that had originally belonged to the homestead had been expropriated for a broad avenue leading up to a bridge and a highway out of town. I marvelled that her father who had come to Canada with only his wits and his brawn at the age of seventeenhad built this beautiful two story home which, Mother recounted, had the best of everything – gas lights to begin with and then electricity, one of the first on the block, and a new fangled telephone which Grandmother fearfully refused to answer. He had bought land and built three homes in Winnipeg before he became crippled by his disease in his early thirties. After an hour or more of slow driving around her early district, we went back to my apartment. Within a week, we had packed all our belongs, taken a plane back to Vancouver, with my belongings shipped and following. We had a long talk about what I proposed to do and where I expected to land when I went back to Burnaby. The upshot was that she offered for me to live with her and we could keep each other company. The house was too big for her alone. If I did not come, she would have to consider selling the house and going into an apartment. But she wanted no strings attached. She wanted to remain independent, go her own way. She expected me to do the same. It would take some thinking. We both had to be sure. I’d had more than my share of mother driving my life, telling me what to do and how to do it. She was the supreme matriarch. Did I want to live with that? But we had been very cooperative and good house mates over the previous month. I won’t tell you all the thought processes I went through to get there. The weighing of this against that advantage and disadvantage took some serious thinking. In the end, I decided that we’d give it a try, and we did. Seven years into the bargain, Mother was slowly getting more and more dependent. Her mobility problems earned her a handicap pass. Her eyesight was failing rapidly. I was helping her with all her banking. Soon it was difficult for her to go out to banks as bills came in. She engaged the family lawyer to give me power of attorney on her banking and all her affairs. We talked about the will and what she wanted to do with it. I never did take the course. It was dreadfully hard to find time. But I became ultra cautious. Mother tithed. She gave very generously one-tenth of her income to charities of one kind or another, in October, just before the Christmas rush on the mail services, so that she could get her tax slips back on time. Now she wanted me to write the cheques for her in large denominations. We sat at the large dining room table one evening to alphabetize all the charity envelopes that had come through the mail, that she had saved for this occasion. There were sometimes three of any one charity and sometimes, like for the cancer related charities who had special divisions like Breast Cancer, Prostate Cancer, Lung Cancer, BC Division, Research division, National division, etc. there were lots more. Once the envelopes were in order, she chose which charities she preferred. We had a pile of those who would receive large donations and those who would get token support. For me it was tedious but she relished the time we spent at it. It was something to do in a world that increasingly had nothing she could do and it gave her a sense of accomplishment. Once I would have written the cheques for her, but now I wouldn’t sign them unless mine was just a countersigning signature. This posed a problem. She could no longer see well. Because she could barely see, she tried to write large so that she could check it out afterwards in the corners of her peripheral vision. At first, she asked me to place her hand where she should start. With her lovely MacLean’s script, she could write her name by memory. But as soon as I put her hand on the paper, she would adjust her hand to be comfortable to write and lose the starting point. We would begin again. And again. Later I began to place a large black dot with felt pen at the starting place. It became a part of her changing signature. For charities, for birthdays, and Christmas, her lovely MacLean’s Method signature was changing, falling crookedly downwards, beginning to tremble like Aunt Delia’s, but on a good day, it was still her lovely signature. On her weaker days, it could be an inch tall, fat and quaveringly round with a letter or two missing off the end of the the cheque. It was a marvel how she could cover up her blindness; it was a marvel she could still write at all. 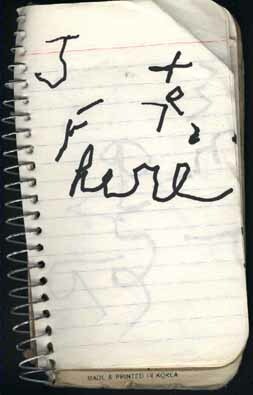 There was some kinetic memory that she could draw on, writing by feel. As I was clearing up some of her affairs from the residence, found this little notebook. 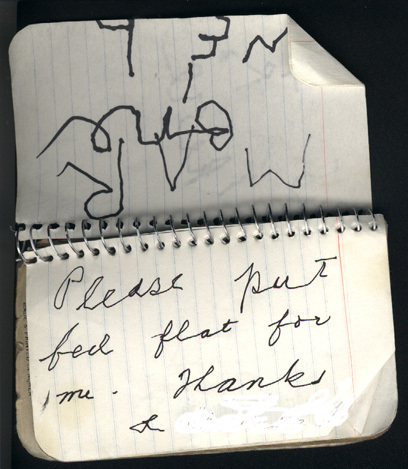 “Please put my feet flat for me” written in passable Macleans and “J and F here”, a reminder that visitors had come so that in the evening, she could remember who had come to visit . What a marvelous lady! . Long time friends – never old! When Mother died, I had lots of changes coming. I’m working them through one by one, not necessarily sequentially, sometimes overlapping the threads of one task with the tasks of another project. I came to live with Mother 12 years ago now, and I’ve already told you about that, and about how the house had to sell because there were four of us inheriting (one should be so lucky) and how we couldn’t buy back into our own district, so expensive the Real Estate market has become. I hedged against this day where I would have to find a new place, those many years ago, by contacting my friend from my first teaching days. She had been the secretary in the first school I taught in but she had moved on to Real Estate. For these many years, the love she has for meeting people and in helping them find the right home or apartment has kept her interest high. Lina found me an apartment, those twelve years ago, in a quiet part of Richmond. It overlooks the back of another apartment complex property that is treed and airy. The apartment is large and full of light and dappling shadow. It’s like being in a small part of heaven. It’s a little bit like living in a very comfortable tree house. The other thing I may not have mentioned so far because in this fluid story, I was kind of keeping it for an ending and now I will have to find a different ending – I bought a house! This house is out in a suburb about an hour’s drive east of Burnaby and it is right next door to Mrs. Stepford. She’s my artist friend (suburbanlife.wordpress.com) and she let me know when it came up for sale. I fell in love with it on the spot and the rest is a story waiting to happen. Now I’m mortgaged up to the hilt until I can sell the apartment I’ve been renting for the last 12 years while I looked after Mother. So, who do I call? Not ghostbusters…. but my wonderful friend, former secretary, now seasoned Real Estate agent and we looked at the place and what needs to be done with it, and how much I can expect to get from it, and how fast it can sell, and all that stuff. Afterwards we shared a few laughs about how we met. There was Lina sitting behind the counter in the high school office, calm looking but going berserk with first day madness. This young thing sashayed up to the counter and stood drumming her fingers on the counter waiting for someone to pay her attention. She was wearing a loud scarlet wool dress with a royal purple band eight inches deep on the hemline which announced her hippie leanings and her position as the new Art teacher. It buttoned right up to her neck and the collar was purple too. The red sleeves came right down to the purple cuff at her wrists. The dress, Kay can tell you, prompted many of her students to ask her if she was pregnant, but it was simply a full A-line dress. It’s a pity there are no pictures of it. Kay thought it was magnificent. Lina looked at this long haired teenager, raised one very English eyebrow and said simply “Yes?” thinking all the while, who is this brassy specimen? “Where are my receipt books?” demanded the specimen. (Kay does not remember being quite so rude, but that’s Lina’s side of the story). Kay had been obliged to collect money from her home room class and from every art class. Without the receipt books, she could hardly fulfill her duty. For a first day, that was practically the only function the home room teacher had! “We don’t have receipt books,” came back the answer in a frosty English accent. Under her breath, but audibly so, Kay the specimen, marched back out of the office muttering disgustedly, “Bloody secretaries and custodians! They run this place! ” Kay had also had a run in with the custodian about some cleaning issue. A fine first day this was turning out to be! Further than that, we can’t remember. Just that we were equally dismayed at meeting each other. Somehow over the two years that we worked together we forged a connection so strong that these “x” number of years later we are the best of friends. We may not see each other every day, may spend years as it has been this last time, and yet when we see each other it’s as if nothing has changed. We can tell each other anything, commiserate over our failures, hug each other over successes, gossip for a good hour or two, and then maybe not see each other for a long, long while. We got to trading stories. I countered with the first time she invited me to her apartment situated in the top level of a house . She was on her second marriage, this time to a very quiet Japanese-Canadian engineer. I chuckled in reminding her that David came home while we were having tea and he hadn’t done something that she had asked him to do. Wish I could remember because the severity of the fault seemed small to me. Whatever it was, they had some angry words with sharp but not raised voices, since David was so quiet. He turned on his heel, walked back out of the apartment and down the back steps. She grabbed a glass from the kitchen counter, followed him out and threw the glass after him. It shattered in a thousand pieces. Then there was the time, we reminisced, that I came down from Sechelt where I had lived with my first husband who I was leaving over issues of drugs and alcohol abuse. I had nowhere to stay and phoned Lina, now a solid friend, who had been coaching me on how to get out of my messy situation. “I’m at the gas station at the corner. I don’t have any where to stay. Could you put me up overnight. I can sleep on the floor.” It was ten o’clock at night. I was only twenty four. I’d only been married two years and my whole life was a mess. I had my car and my clothes in it. I’d had to flee my very own home and sort that out later when I could figure out what to do. Lina would surely know. She’d been through a divorce before. Lina said yes, of course. She asked her ten year old son if he would mind giving up his bed for me, and I slept in that child’s bed overnight. Next day she went off to work. It must have been summer because I wasn’t working. She gave me the run of the house. Pointed out good things to eat in the fridge, but said I could eat anything I wanted, showed me the kettle and the coffee maker, gave me a key. I think I stayed all day in that house, in that haven. I may have even stayed for a few weeks. I was so rattled and burnt out that I was like a vegetable. And Lina looked after me, just as she has looked after countless lost souls – cats, dogs and lost hippies. We can laugh at it now. It’s been a life. We’ve both had to deal with family members with drug or alcohol issues or both. We’ve both had to be independent and creative about earning our livings. We’ve both got a love of literature but we discuss it very little. We love to sit talking over a kitchen counter sitting on stools, or curled up on comfy chairs in the living room, or on a walk along the river dyke watching the snow geese, ducks, dogs and humans out for their fresh air; or, as we did today, as Lina lists my apartment for sale, over a classy hotel restaurant table in upscale Richmond….